DHARAMSALA, India -- Forty-five years ago Wednesday, Tibetans rebelled against Chinese rule in a bloody uprising that led to the exile of the Dalai Lama, who now enjoys a worldwide following but can only hope he will again see his homeland. Since taking up residence in India in 1959, the Dalai Lama has toured 44 countries, been received by three US presidents and won the Nobel Peace Prize, but his travels are ritually denounced by China, which boasts it freed Tibet from a "feudal" regime. Most residents of today's Tibet have not lived under the Dalai Lama, whose predecessors ruled as omnipotent incarnations of the Buddha, and even among the 120,000 Tibetans in exile there are grumblings that the 68-year-old monk's peaceful approach has borne little progress. 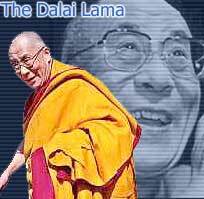 The Dalai Lama spent nearly a week in a Bombay hospital in 2001 being treated for a bowel infection and although he has resumed his rigorous schedule, the illness forced Tibetans to contemplate a scenario without their affable public face. "As long as he is alive, he will be the foremost motivating factor," said Karma Choephel, a member of the Tibetan parliament-in-exile set up by the Dalai Lama in the north Indian hill station Dharamsala. "After his passing away for the next 50 years Tibetans will not be able to bring any sort of momentum for their struggle and the Tibetan issue will be lost," Choephel said. Contradicting the Dalai Lama's stand that Tibet should be autonomous within China, Choephel called for the parliament in exile to seek independence. "If this is done, all other things will follow and our struggle to go back (to Tibet) will gain momentum," Choephel said. The Dalai Lama in 1974 appealed for Tibetan guerrillas to lay down their arms after the United States dropped support for them. Today he argues that a confrontational approach -- such as declaring independence -- would be suicidal against the military might of the world's most populous country. But some analysts believe his strategy of seeking global pressure on China could be just as counterproductive, arguing that it was Beijing's sensitivity about potential foreign intervention in Tibet that prompted it to send in troops in 1950. The Chinese forces initially gave a nominal role to the young Dalai Lama, who was born Tenzin Gyatso and identified by diguised wise men as the spiritual leader's incarnation when he was barely two years old. But as the US-backed Khampa guerrillas battled intermittedly with the People's Liberation Army in eastern Tibet, tensions grew in the capital Lhasa. On March 10, 1959, thousands of Tibetans surrounded the Norbulingka summer palace in Lhasa after rumours spread that the Chinese were plotting to abduct the Dalai Lama by inviting him unprotected to a show at a military camp. While historians question whether the Chinese were planning to kidnap the Tibetan leader, then 23, the Dalai Lama would later write that he had no choice but to flee as "there was nothing more I could do for my people if I stayed, and the Chinese would certainly capture me in the end." Trading his robes for the uniform and fur cap of a common soldier, the Dalai Lama and his aides sneaked out of Lhasa on March 17 just as the revolt turned violent. On March 23, troops hoisted communist China's flag over the Potala Palace, the 1,300-year-old residence of the Dalai Lamas that towers over Lhasa.Seven days later, after crossing the Himalayas and the 500-meter (-yard) wide Brahmaputra river, the Dalai Lama entered India and exile. "China expected that the Tibetan issue will become extinct after their occupation. I think this is a big surprise for the Chinese government that the Tibetan struggle is thriving," said Acharya Yeshi Phuntsok, president of the liberal National Democratic Party of Tibet. "It may be hard to predict when changes will come, but changes will come," he said. The Chinese government argues that since the "Democratic Reform" of 1959, it has pushed a backward land towards prosperity through modernised industry, communications and transport, nearly doubling life expectancy to 67 years. But the government-in-exile and Tibetan activists hold that the Buddhist-based culture has been devastated by a flood of Han Chinese settlement and persecution and that thousands have died -- particularly in the aftermath of the abortive 1959 revolt and during China's Cultural Revolution. Beijing demands the Dalai Lama firmly state Tibet and Taiwan are inalienable parts of China if he wants to step foot again in the land of his birth. At the same time, Beijing has reopened dialogue with the Dalai Lama, receiving two delegations from him since 2002. Thupten Samphel, spokesman for the government-in-exile, declined comment on whether a third delegation would visit China. "Hope is the best friend the Tibetan people have," Samphel said. "Based on realistic hope we are struggling," he said. "But we need to be patient."